Keep reading – there are some pictures further down! Our time in Magina has come to an end, and we have travelled from near Kisumu today to Turi, near Nakuru, to visit friends from UK who are here in Kenya for two years, teaching at St Andrew’s School. We’ve only been here a short time, but the contrast with where we have just left is very noticeable: this school has its own airstrip and we have just heard their school orchestra! The temperature is different here too: we’re 8000 feet above sea level: we’re both wearing fleeces and are sitting in front of a log fire! On the way here, the car thermometer registered 34 degrees: this is more like UK. Millicent is making excellent progress following her operation. She has been discharged from hospital and is now staying at a nearby apartment. Typically of Millicent, a couple of days ago she travelled about 200 km to go and pray with another Kenyan family she had met, where a family member is having an operation for cancer. We doubted the wisdom of this, but the next day she said she had slept well, with no pain, and she is fine. Her doctor confirmed that she is OK and is very pleased with her recovery. She is due to come back to Kenya on 24th November – a day after we leave, so we won’t see her, but the important thing is that she is now able to look forward, God willing, to many years of life without pain. She and Eric are most grateful to all who have helped to make this possible, and are very thankful to the Indian doctors who have been so professional. They give thanks to God continually for the way He has led them through this difficult period. Over the past week, it’s been a matter of finishing what we’d started in various areas. Sue’s big project of turning a room that had been used as a dumping ground and a lovely place for wasps to build nests has been completed. 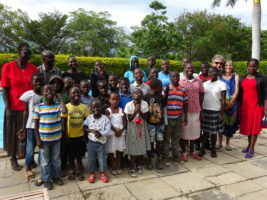 The room is now known as aruma chumba – a room of peace, and, having been decorated and furnished with a couple of sofas made locally for us, is now being used by the children for quiet games, drawing, colouring and reading. Some of the staff also seem to have their eye on the sofas! Sue had her team of willing helpers: Joyce and Richard (the newly promoted site manager at the centre, not Sue’s other half), and various boys of various skills. The girls always seemed to be busy helping with cooking, washing, etc. Equal rights haven’t quite made it to rural Kenya yet. Victor, one of the boys, was horrified to think we had a female Prime Minister in UK! He said it was wrong! No doubt he is inspired by the wonderful job all the male Kenyan politicians do…. Other projects this week have including helping to organise a couple of house builds, one for a local family whose boys were having to find random places to sleep at night because there was no room for them at home, and another for one of the widows we met the previous week, who appears to be caring for several great-grandchildren. Doing building work in Kenya involves getting a ‘fundi’ to quote for the job (for some reason the handwritten scraps of paper they give us with strange words and numbers on them are always headed “Quatation”); then spending most of a morning at the friendly chaos of Mr Akaii’s builder’s merchant, obtaining the materials and organising transport. Our part of the deal is to finance the construction of the framework and roof: the family is then responsible for feeding the builders and providing the mud to coat the house afterwards. We have left both these projects unfinished: hopefully when we return we’ll see completed houses. Thanks to those of you who gave us some money before leaving UK: this has helped a lot towards these houses. 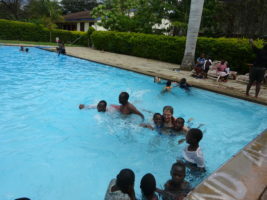 We had a fun afternoon on Monday taking the children swimming. If we had left it until Wednesday, we would almost have been able to swim at the Care Centre, following a torrential downpour that lasted ages, accompanied by thunder and lightni ng. But God was good on Monday, and the rain held off long enough for the children to have a lot of fun in the pool, playing with an enormou s inflatable ball, warming themselves by lying on the concrete slabs at the side of the pool (rather like crocodiles basking), and then having a picnic on the grass. Time spent with these children is always enjoyable, and this particular outing had the bonus of being able to immerse our bodies in water for the first time in three weeks! Oh – I mentioned a traffic jam last Sunday. After working with the children in Sunday School, we had gone with Eric to another little Church. It was the shortest time we spent in a Luo Church service. As we arrived, a mother went outside with her little boy, and Sue quickly realised that he was having convulsions. Following a brief ‘word’ to the waiting people in the Church, we bundled mother and son into the car and set off to find a clinic. The nearest bore the name of St Rita, who is the Saint of the Impossible…but unfortunately not on Sundays…so we found a pharmacy with a helpful gentleman who gave us malaria medicine, etc. We prayed with the mother, and she set off home. We then headed back towards the Care Centre on the horrible busy, narrow road, but about a mile from destination we saw stationary traffic. A lorry and a matatu had scraped each other in passing and were blocking most of the road. There was enough room for one vehicle to go past them slowly, but…. I’m sure most of you have experienced traffic jams, but possibly not quite like this one. Instead of waiting behind the vehicle in front, many motorists (especially bus and matatu drivers) pulled alongside, forming another line along the wrong side of the road. This, of course, meant that nothing could come in the opposite direction – but the same thing was happening there too. So then people were driving off the sharp edge of the road onto the mud, and getting stuck. 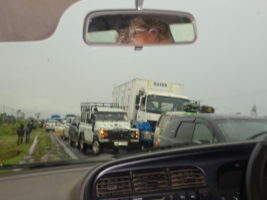 Buses, lorries, matatus, cars, anything going in any direction…total chaos. It took an hour to sort out: once more we thanked God that we got home safely. 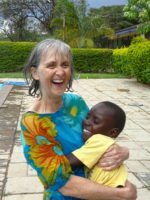 Our plans for the remainder of our time are to head back to Nairobi on Monday, where Sheena will join us in the evening. We hope to travel to Endau (6-7 hour trip) on Thursday, spend Friday at the Pamoja clinic, travel back to Nairobi on Saturday (2 nights at the hotel in Endau is as long as we can cope with), then spend our last few days in Nairobi before returning to UK on Thursday. Thank you once again for your continued interest, support and prayers. We are very thankful that we have got this far in safety and generally good health. I hope we’ve been able to help a few people: once again, being among our friends in Kenya have certainly blessed us.